Steven Heller wrote a lovely obituary for the late and great Alex Steinweiss in today’s New York TImes. I had never heard of Steinweiss and I’m sorry because his contribution was huge. As advertising manager for Columbia Records he essentially introduced original artwork to the record sleeve. If you consider a time before records used covers for marketing but consider how cherished is the tactile experience of holding a sleeve and hearing amazing music, you get not only the idea of the contribution he made toward elevating that music purchasing and listening experience, but also what an impression that must have made onto other marketed and decorated product packaging. Records are at the center of cherished products and they are so largely for their unique art. What an amazing contribution to make to industrial design in general. Read the full obit. My lady saw this and sent it to me. Presumably it’s an antique (delivery?) 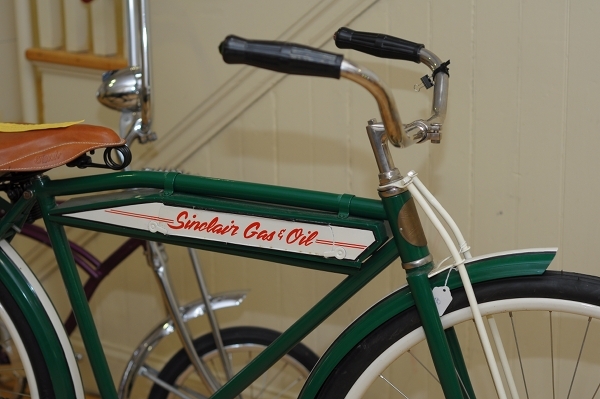 bicycle branded with ad space for the Sinclair gas and oil company. I would have thought oil companies would have wanted to destroy bicycles the way they destroyed the street car industry. Maybe not. Anyway, I want it. I also want this Sinclair grease can I saw in a window today. $95. Who wants to buy me more junk?